Looking for ideas for your holiday cheese gift baskets? 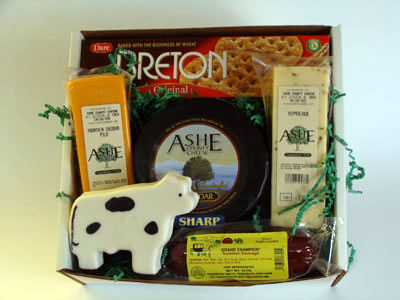 Ashe County Cheese has you covered no matter the occasion or cheese gift need. You can customize all of our holiday cheese baskets to include your favorite varieties of cheeses and other items. This means that you’ll be able to include your loved ones favorite cheeses and ensure that you get the cheese varieties that you love! Our cheese gift baskets are the perfect gift for Birthdays, Anniversaries, Thanksgiving, Christmas, Mother’s Day, Father’s Day, vacation arrival presents, hostess gifts, housewarming presents, and corporate gifts. You can order them online and have them shipped directly to the intended recipient or to your location. We have large and small cheese gift baskets that we allow you to select the cheeses that are included as well as other items. If you have a budget in mind, we will have a price point that meets that budget expectation. It does not matter which price point you choose, you will be able to customize the basket easily. Some larger baskets include other items such as meat, crackers, jams and adorable cheese cut outs that come in a variety of shapes! Kids especially love the Blue Ridge Favorite and Blue Ridge Supreme cheese gift baskets that feature a cheddar cut out of their favorite animal or toy. We have the following cut outs that you can select for either basket: cow, green tractor, red tractor, green tree, North Carolina shape, mouse, rabbit, Dalmatian and dinosaur. Ashe County Cheese has been operating since 1930. Our historic cheese factory is located in the Blue Ridge Mountains and we hand craft all of the varieties that we sell on site at our factory. We use fresh, natural ingredients in all of our cheeses ensuring that your gifts are straight from the farm and fresh. If you are looking for the perfect gift basket, of handmade, locally sourced items buy from Buy Cheese Online from our online store.